Bournemouth Borough Council: Pure Town Planning are delighted to announce that we have just secured planning permission for Southbourne Surf Life Saving Club to remove their existing club structure and erect a new 2 storey state of the art lifesaving /lifeguard training facility at the bottom of St Catherine’s Path near “Bistro On The Beach” in Southbourne, Bournemouth. 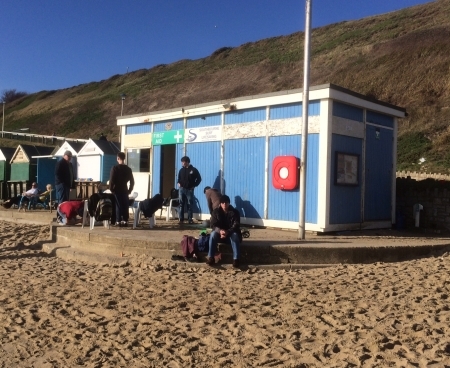 Southbourne Surf Life Saving Club is a group of voluntary beach life savers dedicated to building a healthier and safer community for Southbourne’s beach users. It was founded in 1986 and over the years the club has expanded massively, especially in the Young Life Savers section. Their members come together and give their time freely, where they learn Lifesaving skills and compete in Life Saving Sport events. Southbourne Surf is affiliated to Surf Life Saving GB which is the awarding body for the highest standard of Beach Lifeguard Qualification in the country, and is the National Governing Body for Life Saving Sport. The club have a Strategic Partnership with the RNLI. Their volunteers work closely with the RNLI Beach Lifeguards providing a joint Lifeguard service and beach patrol in the Southbourne/Boscombe area of Poole bay. For more information visit their website. Our brief was to look sensitively at how the existing lifesaving facility could be replaced with a facility that allowed the operation to work effectively and appropriately to meet the expanding needs of the beach area. As can be seen from the photographs, the existing facility in essence is a ‘porta-cabin’ it is totally inappropriate in terms of functionality, construction and visually for this prominent beach front location. Added to this was the issue that the current facility does not provide appropriate access for the disabled and nowhere for wet weather teaching/training. As we know it’s not always sunny down here in Bournemouth! The proposed design sought to create a durable facility that was appropriate in terms of scale and the use of materials. The base and wall elements incorporated Portland Stone whilst the upper elements used timber cladding that reflected the vernacular of nearby beach huts. On a practical level the proposed replacement building delivered everything that was required: fully compliant with current DDA regulations and will provide access for the disabled, it also provides a level access for the lifesaving boat and associated equipment at the rear, separate male and female toilets, showers and changing rooms (currently the lifeguards have to walk down the promenade to use the public facilities). Upstairs there is a large open plan teaching area for seminars and wet weather teaching as well as a balcony/observation deck providing a better view of the surrounding beach and sea area on which they patrol. 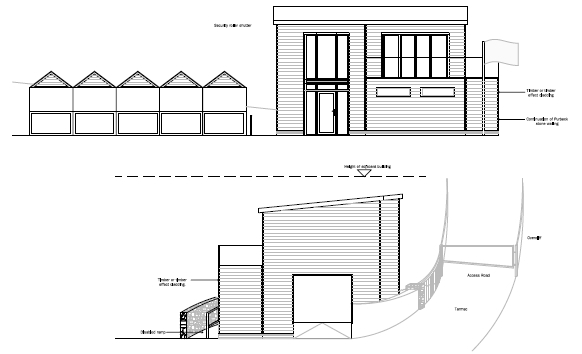 Pure Town Planning are very proud to have secured permission for this fantastic facility which will allow beach operations to be better coordinated from the new facility and will ensure closer links with both the coastguard and the Poole bay control room which has links with all lifeguard facilities in Poole/Bournemouth bay. The Inshore Rescue Boats that the structure will store overnight can be deployed at the request of the Coastguard, Poole bay control or instigated in house in response to an emergency. This latest consent demonstrates the Pure Town Planning team’s versatility. If you require planning permission for any type of building/structure for any use then why not call Pure Town Planning to find out how we can help you.